Participants in the Aviation, Inspiration and Motivation High Outreach Program pose for a photo at Davis-Monthan, Ariz., Jan. 26, 2019. The free one-day interactive program featured civilian and military aviation professionals that served as role models and facilitators for engaging activities. 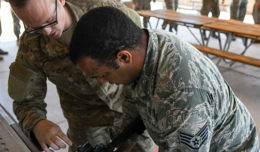 Davis-Monthan Air Force Base in Arizona held the first Aviation, Inspiration and Motivation High Outreach Program on Jan. 26, 2019. The A.I.M. 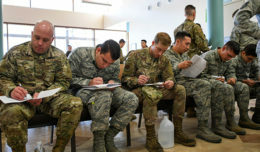 High Outreach Program was created by Air Force Recruiting Service Detachment 1 in an effort to help the pilot shortage and improve pilot diversity. The free one-day interactive program featured civilian and military aviation professionals that served as role models and facilitators for engaging activities. During the event, more than 80 local youth, enlisted members and Air Force ROTC cadets took part in science, technology, engineering and mathematic experiments conducted by the Civil Air Patrol. Participants also had the chance to talk with Davis-Monthan AFB pilots who discussed the importance of positive character, experienced virtual reality simulations, explored college and career opportunities, and were given introductory flights provided by Embry-Riddle Aeronautical University. 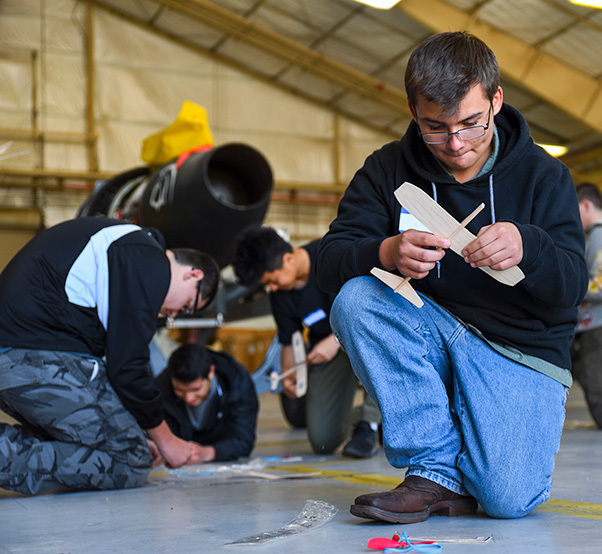 Teens from the Tucson, Ariz. community build miniature glider planes during the Aviation, Inspiration and Motivation High Outreach Program at Davis-Monthan, Ariz., Jan. 26, 2019. Participants in the program took part in various activities including flight simulators, introduction flights and talking to pilots. “Team D-M and the A-10 Demo Team were honored to host this first ever event and look forward to continuing to engage with our community throughout the year, and especially during our upcoming airshow in March,” said Col Chad Balettie, 355 Wing vice commander. Davis-Monthan will host the “Thunder and Lightning Over Arizona” air show on March 23-24. 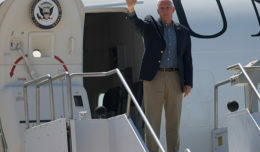 In order to continue their outreach, AFRS Det.1 plans to host several more A.I.M. High events across the country throughout the year.